Old Spain meets cutting edge chic in this central Spanish city and our 24 hour guide to Madrid will help you steer between the two. Check out an ancient sweet shop specialising in Parma Violets, club through the night in techno hangout Demode and enjoy the early morning views from the 17th century Templo de Debod. Breakfast at El Brillante may be chaotic, but there's no better way to start the day. MadrileÃ±os tuck in to freshly squeezed orange juice, tortillas and industrial strength coffee at this tapas bar. Don't worry about chucking used serviettes on the floor - it's part of the etiquette. 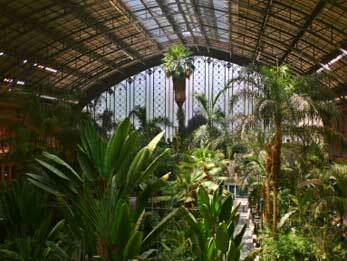 Life gets going late in Madrid, so this is the perfect, peaceful time to explore this busy commuter railway station and its unusually located lush tropical garden. Grab a bottle of water and luxuriate amidst the 500 different botanical species. 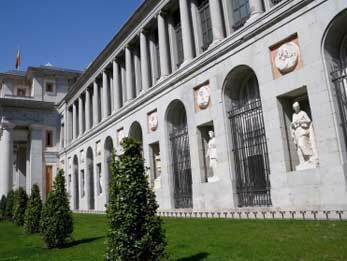 Madrid boasts three of the world's finest art galleries (the other two being Thyssen-Bornemisza and Reina Sofia), all within a stone's throw of one another, and the Prado is the jewel in the crown. All your Goya, VelÃ¡zquez and El Greco needs will be sated between these four walls. Hunks of tuna the size of a small car, the odd escaped crab, Chinese noodles and South American fare... Los Mostenses is one of Madrid's biggest food markets. Look for Spanish favourites such as shellfish, hams and cured meats. Once a dodgy part of town, now one of the city's coolest shopping avenues. 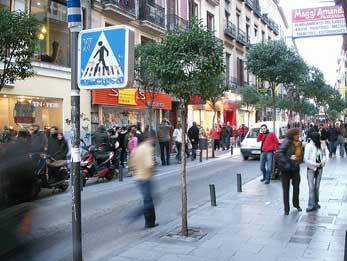 You'll find everything from clubwear and designer labels to interior design shops and funky tapas bars. Chiquipark is a mammoth children's activity centre with a crÃ¨che, two-floor play area, slides, toboggan runs, ball pits, inflatables, crash mats, internet area... Take the kids and watch them go wild! Stacked to the rafters with English-language books and magazines, J&J Books is a great place to meet English speakers as well as those wanting to improve their language skills. Order a drink at the bar and challenge someone to a game of Scrabble to get things started. Madrid might not be near the coast, but fantastic fresh sea food is flown in every day. At Ribeira, the fresh shellfish is the star. Feeling brave? Try the flaming liqueur that comes after dessert. 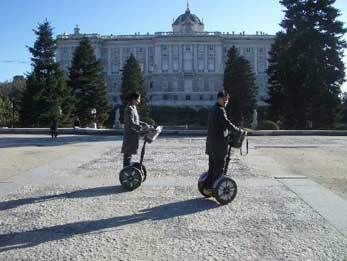 Lunchtimes are strictly observed in Madrid. Bigger stores are open in the early afternoon but fairly empty so this is the perfect time to do a spot of European shopping and explore French megastore FNAC as well as Spain's largest department store El Corte Ingles, both on Calle Preciados. English speaker Antony will be your guide on this tour that takes in the Plaza Mayor, Royal Opera and Plaza de EspaÃ±a. He'll also teach you how to use a segway - a gyroscopically balanced two-wheeled wonder of transportation. You'll get to enjoy regular bar stops too. Remember those Parma Violet sweets you used to scoff as a kid? They're the star product at this quaint little sweet shop. You might be tempted by the candied fruit and grown-up chocolates too. A boating lake, grand monuments and immaculately kept gardens - all reasons why MadrileÃ±os have kept coming to this park since the 17th century. There are puppeteers and street performers on hand to keep children entertained. The Spanish don't sit down to dinner until at least 10pm. 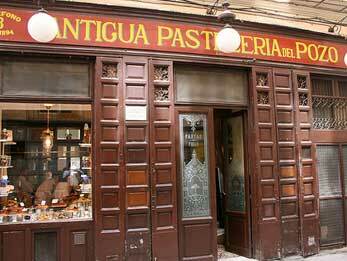 Tiding them over since 1830 has been pastry shop Antigua PastelerÃ­a del Pozo - not even the decor has changed. Try a roscÃ³n - a huge ring pastry filled with cream - and turrÃ³n nougat. Find your duende - that mythical emotional state that only flamenco can evoke - at Las Carboneras. Its outstanding guitarists, singers and dancers make this one of the finest shows in town - Â¡ole! Real Madrid star Guti's favourite wine bar, with its huge wooden wine rack stocked with bottle after bottle of fine Riojas and Ribera del Dueros. It's Spanish dinner time! Work your way down the tapas bar at Txakoli. Be sure to try at least one that comes with Spanish ham, as well as the crab and mini-hamburger varieties. Cool jazz joints don't come much cooler than El Junco. If there's not a live jam session you'll be able to enjoy DJ sets from local vinyl connoisseurs. MadrileÃ±os love the cinema, so beat the queues by going at midnight. At Cines Princesa English-language films are subtitled rather than dubbed, so even if your Spanish is limited to "dos cervezas" you'll be able to enjoy the action. Pool sharks of all nationalities hang out at Shooters, Madrid's finest pool hall. This is also the place to come for a proper pint - Spaniards tend to enjoy small caÃ±a-style beers. One of the city's coolest venues (located in a former house of ill repute), Demode is a pre-club haunt sporting a strange combination of techno and chandeliers. Get here before 3am and you'll be on your own. House and techno is dished out by resident and visiting international DJs - Josh Wink is a regular, as is the British legend A Guy Called Gerald. Fancy dancing to cheesy Spanish pop? There's no better place than Torero ('bullfighter' in English). Guys and girls will be all dressed up smart and busting some serious salsa-style moves. Come to ChocolaterÃ­a San Gines for chocolate con churros - rings of batter dipped in impossibly thick hot chocolate. Don't be surprised to see families with toddlers still running around in the wee hours - that's the Spanish way. 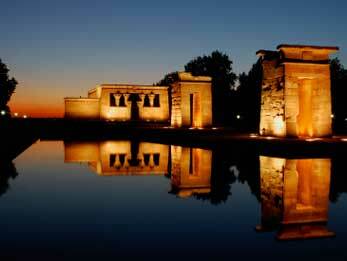 The Egyptians donated the Templo de Debod (early 2nd century BC) in gratitude for Spain's help saving (the even older) Abu Simbel temple complex. Watch the sun come up here and get a magical view of the Royal Palace and the city.